What to put in your notes (from the protocol handbook). Important points the people regularly miss are highlighted in blue. Please review this list regularly. Each new protocol/experiment should start on a new page. While a notebook is recorded chronologically, it is not correct to list all things done on a particular day as a single entry. Some days you may be carrying out multiple experiments/protocols, and some protocols will take more than one day. If a single protocol/experiment does run over multiple days, indicate “continued on pg# ” at the end of each entry and “continued from pg# ” at the start of every entry. That way, even if your entries are discontinues, you can easily follow the experiment. Always note the date (including year) and a descriptive title at the top of the page. For example, "plasmid isolation" is not specific "pUC18 plasmid isolation" would be better. All experiment titles and page numbers must be listed in the table of contents. Clearly indicate the source of starting materials (where did the cells/DNA etc. come from). Occasionally, someone other than yourself will perform procedure steps for you. Clearly indicate the when/how/who of any steps not completed by you. Clearly indicate the protocol source. If the protocol is published, reference it. If it is your own protocol, make reference to the title and version. Clearly indicate how and where all materials produced are stored. For example, if you isolate a plasmid you will be keeping it somewhere for further use – indicate how it is stored as this could influence your results (and you need to find it). Keep track of what you do in your own words (point form is preferred). Even if you have referenced a protocol, you still need to record how you implement it because often you will make small changes that may be important. 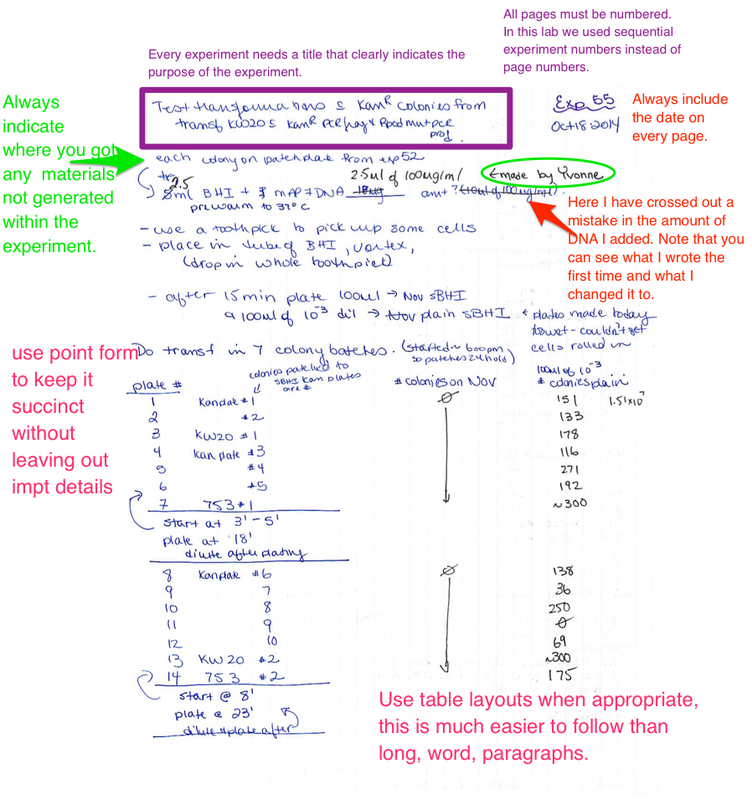 Where appropriate, use tables or drawings to simplify your notes. For example, describing how you set up an enzyme digest in long hand is confusing but the same information in a table is much easier to follow. All solution recipes should be in the notebook . It is acceptable to have them all in one place (for example at the back of your notebook) and reference them by page number. Note name and model number for specialized equipment (not necessary for standard equipment like pipetters and micro-centrifuges). All data collected should be in your book. 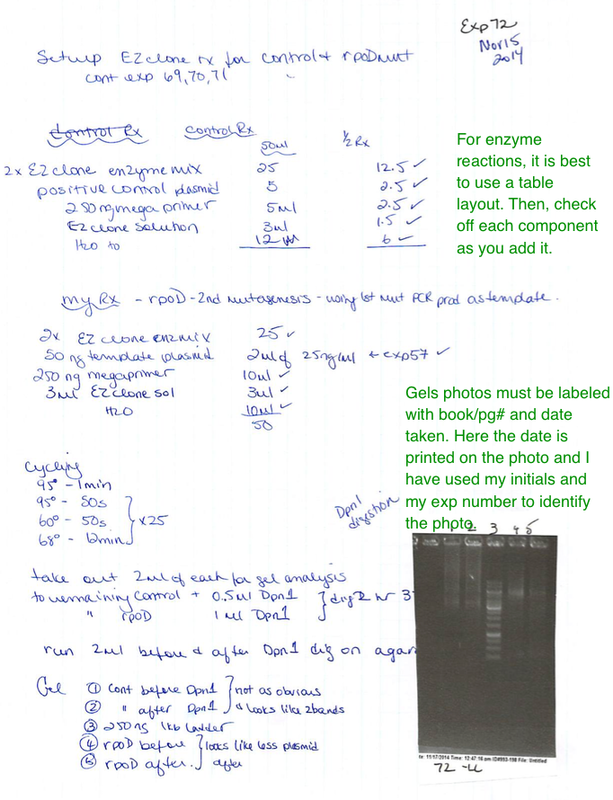 If the data are printouts or photographs, attach them to your book. Make all data are labelled with the date collected, your name and the page number where the data is supposed to live (photographs can fall out of notebooks). If it’s not possible to attach the data, clearly reference where they are stored. Clearly describe your analysis, interpretations and thoughts, and clearly indicate what is your interpretation. For example, "plasmid yield was low, perhaps due to lower cell density as cultures were not as turbid as usual". You never know when an observation like this might turn out to be important. It is vital that others be able to easily follow your notes. This means the notes must be logically organized, succinctly presented and legible.